Unlike traditional skincare spas, we really dig in and treat skin issues. We even clear acne. We’re not afraid of it, we love it. Treating acne is mostly science with a little bit of art mixed in. The art comes into play because not one person is exactly the same nor has the exact same acne – so we make tweaks here and there to make our treatment suit you and your skin. Our end goal is to get you clear and also help you learn about your own skin and acne triggers. This gives you the tools you need to prevent any future breakouts. Aim to arrive a few minutes early so that we have plenty of time together. And come as you are. Please don’t be concerned with applying or removing makeup prior to your appointment. We are happy to remove any makeup at the beginning of your session. In advance of your appointment, please take about 15 minutes to complete the initial Acne Intake Form to help us fully understand your past and current skin issues, current homecare regimen, and any allergies or medications that may affect the treatment or your skin. You may submit it online to us and even download a copy for yourself, if you’d like. Please remember to bring any current skincare or makeup items you use on your face (or other broken out areas like your chest or back). If the product bottles do not have the ingredients listed, there is no need to bring them along. We can look up the ingredient list online during the session to review any impact they may be having on your acne. Once we’ve reviewed your intake form, we’ll have a face-to-face discussion so that we can better understand what you’ve indicated on your form. After we have a thorough understanding of your skin history, its conditions and your goals, the care portion of the session will begin. Simply recline back on a cozy, warmed spa bed and let us take care of your skin. During this time, depending on the condition of your skin and the grade of your acne, we will prep your skin and then work to extract as many of your acne lesions as possible. We use a gentle touch, but this can be uncomfortable at times. The jawline and upper lip area tend to be most sensitive. Discomfort is usually mild and temporary, and it means you are a step closer to clear, manageable skin. After we’ve completed the extraction portion of your first visit, we’ll know so much more about your specific acne. Next, we’ll talk through your next steps on your journey to clear skin. You can expect to leave with a better understanding of your acne and your new skincare routine. We’ll also book your next session! You can expect your skin to be a little pinker and possibly slightly swollen in the areas that were treated during the appointment. 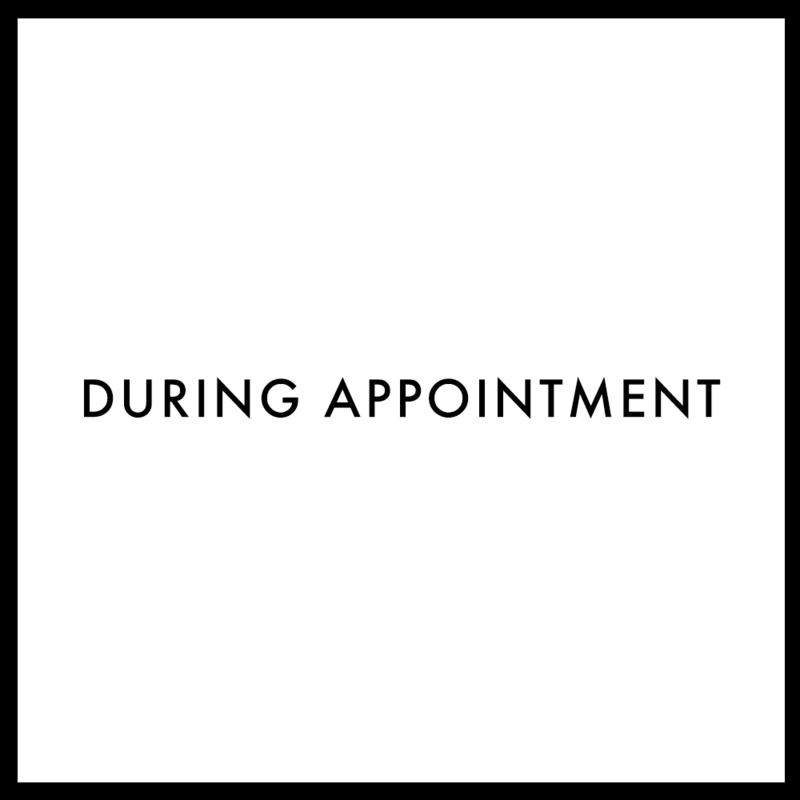 Knowing this, it’s important to schedule your first appointment accordingly. We always encourage our clients to ice any inflamed areas to help speed up the healing process. Depending on each individual’s sensitivity level, the healing process can be anywhere from a few hours to a few days. Skin healing varies based on the condition and skin type. Icing: After cleansing your face, grab an ice cube and wrap half of it in paper towel - this is the end that you will hold on to. Next, gently massage the exposed ice cube on the inflamed areas. Ice for 2 minutes and take a 1 minute break. Repeat this process 2 more times until inflammation has subsided. Please note: holding the ice in one area for too long may cause ice burn. Once you've completed icing, complete the routine with the rest of your home care regimen. Cleansing: Start by splashing your face with room-temperature water until your makeup begins to rinse away. Next, grab a nickel-sized amount of cleanser and disperse it between your two hands. Begin cleansing the area of your face that is most affected by acne. Continue to massage the cleansing product into your skin for several minutes. If this is the first couple of weeks of your new regimen, start with just 30 seconds around the outside of your face (this area is less sensitive). Remember that most sensitive areas of your face include the apples of your cheeks, just below your eyes and also your nostril areas. While cleansing, avoid those areas until the final moments of your cleansing so that you do not over-cleanse or irritate them. Sensitivity: If you're having any sensitivity with your new skin care regimen, there are a few actions you may take. During your PM cleanse, use less product and more water to dilute the cleanser. Also, you may cleanse for less time than we initially instructed. You can also skip a night (or more) of your serum application. Apply more moisturizer throughout the day or slide a little bit of petroleum jelly to any inflamed areas. Once your sensitivity has subsided, slowly work your way up to using the products as we discussed. Your skin needs the ingredients in these products to keep your acne clear, and some people are more sensitive than others. Slow and steady is best until your skin has built up a tolerance to the treatment. Over the course of a week or two, you will be delighted with the clarity of your skin. As you continue to use your new homecare products, you may need to vary the usage slightly based on your skin’s sensitivity. Please contact us with any questions on how to change your regimen. Based on your specific acne, some breakouts may start to slowly reappear over the next two weeks until your next visit. This typically occurs 3 to 4 weeks after your initial appointment. It’s important to remember that every client is different, so monitor your skin closely and keep a log of your progress.